Oriental Rug Pros boast expertise in cleaning all kinds of rugs, including the most sought-after variety–antique hand-knotted antique rugs from different countries such as Turkey, Persia, Pakistan, India and so on. Our clientele doesn't just consist of homeowners, but also rug importers and antique dealers, as these people know how to pick the right company to treat their valuables. 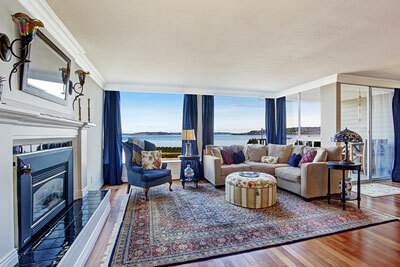 Our meticulous process of cleaning antique rugs leaves nothing to chance. We first inspect the antique thoroughly in order to gouge the intensity of potential spotting and stains, and we also ascertain the kind of dyes it has to know if color bleeding is expected. After our evaluation, we thoroughly vacuum the rug by using heavy-duty vacuum cleaners – thanks to the strength of our machinery, much of the dust and dried dirt is wiped out before the wet cleaning begins. When cleaning, we use lukewarm water to clean the rugs as it helps keep the antique rug's precious colors intact, and we're also sure to use-eco-friendly cleaning agents that do not harm the rugs no matter how fragile and sensitive they are. Come drying time, we turn to our specialized drying room where we utilize air circulation, heat and a dehumidifying process in conjunction for optimal results. While these help dry the antique rug sooner, we find that a proper drying process still takes many hours even in the case of thinner pieces. To top the customized treatment off, we use brushes with soft bristles to groom your antique rug and thoroughly inspect it again for any remaining stains before returning it to you. For lovers and collectors of classic items, antique rugs are often a must-have in drawing rooms and bedrooms – they double-up as an emphasis point in any interior and a marvelous art piece on par with any great work of art. 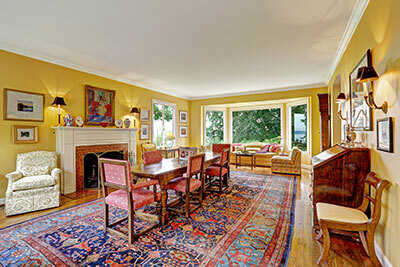 Like all antique valuables, however, antique rugs require personalized care and regular maintenance – for both of these purposes, the best choice is to hire professional rug cleaners. Expensive rugs of the antique variety are too precious to subject to self-cleaning attempts and one should always let experienced professionals handle the job. Having your antique rug cleaned by us is paramount to preserving its value and beauty. We have an ambitious team of professional rug cleaners who are experts in dealing with antique rugs of every kind and who have been cleaning, repairing and restoring antique rugs back to their original glory for many years. To our team, cleaning antique rugs is a lengthy process that goes far beyond the obvious removal of surface dirt and aims to preserve the fibers' beauty and structure at all costs. Rest assured that our team of specialists has enough experience and knowledge to properly maintain and clean any antique rugs, as the many known and reputable collectors we work with can attest to. Our dedication towards our work with antique rugs has earned us the status as the company of choice for most museums and high-end rug owners who seek no less than the best. All fine rugs, whether antique or Oriental, require periodic and thorough professional attention every six to twelve months for optimal condition. In addition to antique rug cleaning services, we also provide cleaning and maintenance for fine rugs from all over the world. From contemporary Chinese rugs to Indian antiques and from Persian collectibles to precious tribal pieces, we clean them all as true masters of their craft should. Moreover, our cleaning procedures range widely from dry to wet and soft to hard, depending on the material and quality of the rug. The more sensitive silk rugs require gentle cleaning, as do the hand-knotted woolen antiques which, although resilient in nature, still need to be handled with care due to their value – if, on the other hand, your rug is equal parts sturdy and dirty, we'll recognize it as such and apply a more vigorous method for best results. For years and years, our team of professional rug cleaners has been gaining experience and has successfully reinvigorated highly valuable rugs with sensitive fabrics and colors that allowed for absolutely no mistakes. Our antique rug cleaning services are performed in our special design and restoration studio, with all the space and equipment needed to easily accommodate a precious wall-to-wall rug as well as an antique area piece, which is why we never have to turn down a client regardless of the rug they own. Don't dwell too much on the current state of your antique rug – all that matters is that you've made the right choice to work with us, and it's a choice that your beautiful heirloom rug will thank you for.